The recently concluded UN mission to Burma was a toothless mission. Opposition leader Aung San Suu Kyi showed more spirit by her unhappy face and by wearing a yellow dress as a symbol of protest to support her brave monks. Commentary by Htet Aung. 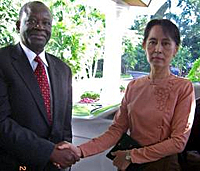 UN special envoy Ibrahim Gambaris four-day shuttle diplomacy between Burmas top generals and the countrys detained democracy icon Aung San Suu Kyi concluded on Tuesday (Oct 2, 2007). and Aung San Suu Kyi. Several of the photographs of the special envoys meeting with Suu Kyi appeared in the international media. In some of the photographs, her face expressed grave unhappiness and sent a clear message to the world community: the generals' crack down on the Buddhist monks peaceful demonstrations prove UN action on Burma is urgently needed. 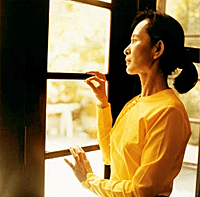 In one photograph, Suu Kyi wore a yellow, traditional-style blouse - the color represents Buddhas Sasana (the Order of Buddha). She shrewdly showed her support for the Buddhist monks efforts to bring about peace and national reconciliation in the country. Detained since May 2003, she had recently appeared in public wearing the same yellow dress when she paid homage to protesting sons of Buddha who had gathered in front of her home to chant the "Metta Sutta" (the Buddhas words on loving kindness) on September 22. This time, there is no doubt that she, through the good office of the UN secretary-general, would seek a way to bring about reconciliation in the country while the fear-driven generals at Naypyidaw seek to deceive the world. The Burmese people are exhausted by... words. Many people now believe that democracy will come only with the sacrifice of tens of thousands of lives. The six-week-long protests have further diminished the generals' seven-step political road map to democracy, which, in fact, is a way to cement the generals' power, legitimately, under the forthcoming new constitution. The generals' pathetic attempt to stage pro-regime rallies for the benefit of special envoy Gambari showed their callous disregard for reality. Are they oblivious to the fact that the Burmese people have voted against them with their lives? Since 1991, the United Nations General Assembly has adopted a series of resolutions on the Burma situation but to no avail. Now is the time for the UN Security Council to adopt a binding resolution to restore reconciliation and democracy in Burma. The UN Human Rights Councils special session on Burma on October 2-3 in Geneva said it "strongly deplored the continued violent repression of peaceful demonstrations in Myanmar [Burma]." This time, the resolution was adopted by consensus with the cooperation of the regimes strongest supporter, China. Unfortunately, the body has no power to help the oppressed people of Burma by sending a mission to investigate the regimes brutal killings, as requested by more than 200 human rights and civil society organizations in 17 countries. How long will the civilized world ignore the notorious generals' slaughter of innocent people? "The world is watching and while the time for mere words has passed, decisive action is now needed. No State can condone such actions," Paulo Sérgio Pinheiro, the special rapporteur on the situation of human rights in Burma, told the session in Geneva on October 2. However, the Burmese people are exhausted by such words. Many people now believe that democracy will come only with the sacrifice of tens of thousands of lives. Note: The above commentary was posted at The Irrawaddy News Magazine (www.irrawaddy.org). Click here for the latest on Burma.